In an earlier post, I shared some pics from our trip to Lindsborg, Kansas. While there, we also toured a flour mill built in 1898 that, for a couple of days each year, is cleaned up and turned on! Amazing. 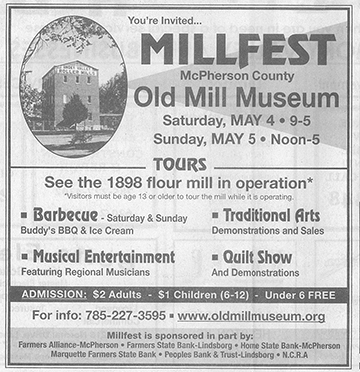 Below is an advertisement from The Lindsborg News-Record of the Old Mill announcing their annual event, Millfest. They even dressed the part and gave us a fabulous tour of their mill. 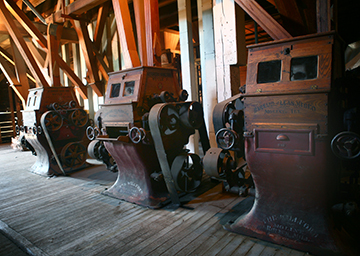 It was especially exciting touring this mill because for the most part, it’s a carbon copy (well, inside at least) of my J.C. Barron Flour Mill, located in Oakesdale, Washington. 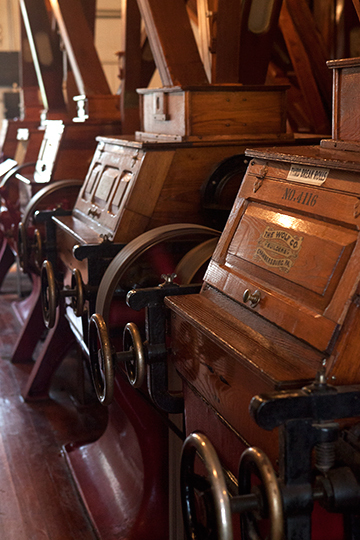 I purchased the mill from Joe Barron with the promise to do my best to preserve his history and its legacy. He was a third-generation miller. (We met and worked together while I was working on my organic backpacking food line.) 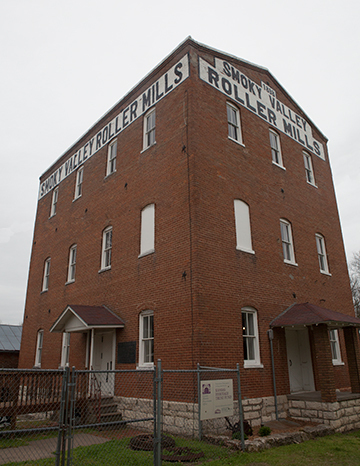 My mill was moved by rail car to its current location from Pennsylvania in 1906 by Joseph’s grandfather, but was built around the same time as the Smoky Valley Roller Mill, 1889. The main difference between our two historic monuments (both are registered on the National Registry of Historic Places) is the outside of mine was built with wood, and theirs with brick. The brick has helped immensely to preserve their mill. The outside of the mill in Kansas. My mill, made out of wood, in Oakesdale, Washington. Inside of the mill in Kansas. All shined up and rollin’! Inside the J.C. Barron Flour Mill. 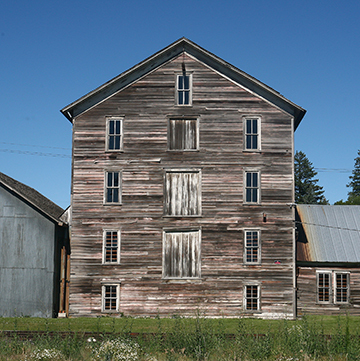 July 20, 2013, we are going to celebrate the lasting legacy of the J.C. Barron Flour Mill at Old Mill Days in Oakesdale. There will be a parade, run, food, games, vendors, music, crafts, and a beer garden. And the fun doesn’t stop there! You’ll have loads of fun attending the street show, participating in the landmark tours, showing off your car or tractor at the car and tractor show, and sinkin’ hoops at the Masonic Hall 3-on-3 basketball tournament. Come on over to the Oakesdale Mill website to donate, volunteer, or sign up for any of the events listed. Phooey! I will miss being able to attend by 4 days! One of the chapters in your Ideas book that I loved best was the story about the acquisition of the JC Barron Mill. It was so worth the money and time to preserve a piece of the regions’ history. 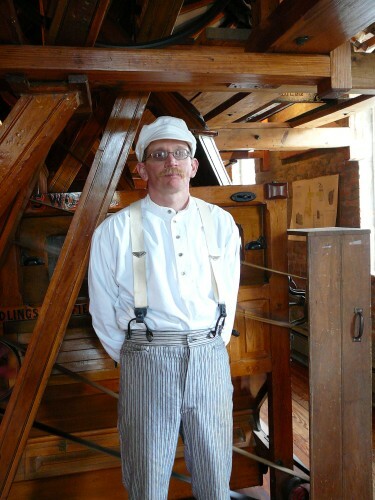 A few years ago on a visit to Minneapolis MN, I had the opportunity to visit the old Gold Medal flour mill which has been turned into a museum. It sits along the banks of the Mississippi River facing the Pillsbury Flour Mill which is now closed up. So many layers of history and stories of life in the mid west along the great river! Here in the South, we still have a few working corn grist mills where you can visit and purchase fresh ground corn grits and corn meal. It is so much fun to watch and then take home a purchase in those cloth bags. I hope you have a great turn out to your event on July 20 and raise much needed dollars to continue the care of the mill for generations to come! Is this near Spokane, WA? Yes, about 45 minutes away. I love history of old factories & mills & about anything else. When my hubby was at Mayo Clinic, Rochester, MN,I toured the floor with all the history & found out some very unique things about the Mayo Brothers & the Clinic itself. It is fascinating to me!